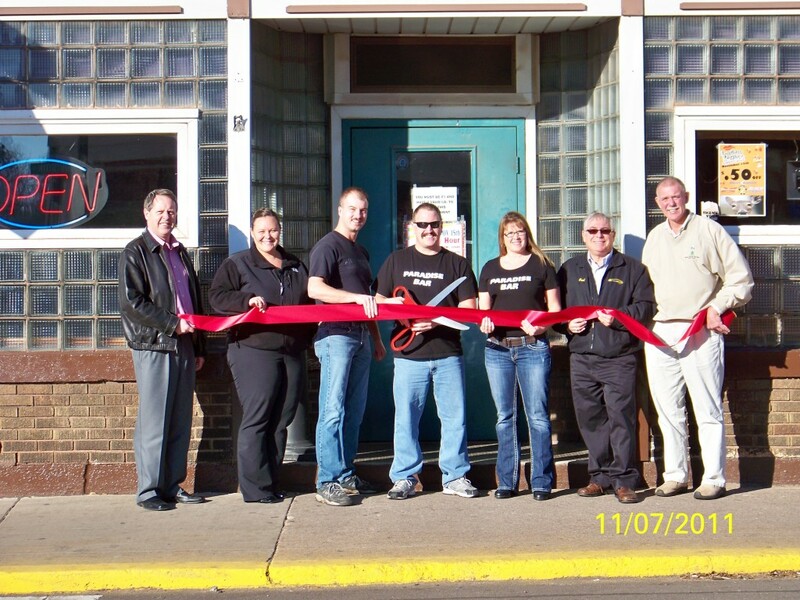 The Paradise Bar celebrated the business’s new ownership with a ribbon cutting ceremony with the Lake Superior Community Partnership. The business was purchased by Ernie Lindsey, Wesley Leece and Tammie Leece. The Paradise is located at 122 West Division Street in Ishpeming and is open from 10am to 2pm Monday through Saturday, and Noon to close on Sunday. Come in for Karaoke every Friday and Saturday night and try the new “Paradise Punch”. Attending the ribbon cutting were Marquette County Ambassador Keith Moyle, Lake Superior Community Partnership director of marketing and public relations Lindsay Hemmila, Paradise Bar co-owners Wesley Leece, Ernie Lindsey and Tammie Leece and Marquette County Ambassadors Paul Wolfson and Tom Edmark. 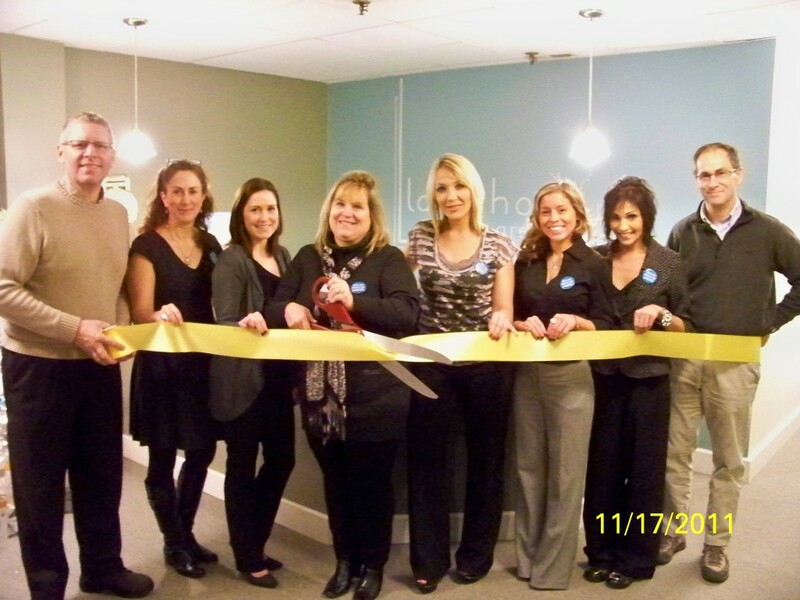 To celebrate a year at their new location, Lakeshore Skin Care held a ribbon-cutting with the Lake Superior Community Partnership. Located at 307 South Front Street in Marquette, Lakeshore Skin Care specializes in skin rejuvenation, vein treatment, hair removal, BOTOX and more. The hours of operation are Monday, Thursday and Friday from 9:00 am – 5:00 pm and Tuesday and Wednesday from 11:00 am – 7:00 pm. For more information, contact the experts at 273-0512 or by visiting www.lakeshore-skincare.com. Attending the celebration was Marquette City mayor John Kivela; Kim Jameson, RN; Chelsea Kotval, office manager; Therese Letts, RN and owner; Amy McInnis, RN; Bridget Murphy, office staff; Chauntel LeTrent, Make-up consultant; Marquette County Ambassador Dan Landers. Mill Creek Assisted Living held a ribbon cutting with the Lake Superior Community Partnership to celebrate the opening of their brand new memory care unit. The new addition to the facility located at Harlow Farms in Marquette is an investment of nearly $3 million dollars, allowing for specialized care provision to Alzheimer’s and Dementia patients. Attending the ribbon cutting were Marquette County Ambassador Pat Bray, architect Don Klimmer, Marquette Township Manager Randy Girard, Harlow Farms developer and owner L.R. Swadley, Mill Creek operator and owner Missy Hinkson, manager Mary Mahaney, Lake Superior Community Partnership marketing and events assistant Crystal Kuklinski and Marquette County Ambassador John Marshall. 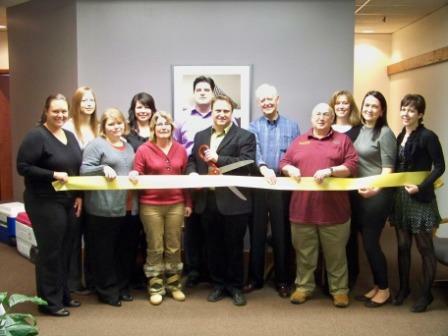 Northstar Employee Assistance Program (EAP) celebrated their first year anniversary with a ribbon cutting with the Lake Superior Community Partnership. The 3 year old company was purchased a year ago by Don Grisham. Northstar EAP, with staff in Marquette and over 20 counselors throughout the Upper Peninsula, provides EAP benefits along with professional private counseling. “We are very encouraged by the interest U.P companies have in providing this affordable benefit to their employees. They are pleased with the results of improved morale and more focused employees on the job” Grisham says. Attending the ribbon cutting were Amy Clickner and Tony Stagliano of Lake Superior Community Partnership, Northstar EAP Business Manager Melissa Skewis, owner of Northstar EAP Don Grisham, along with and Director of Marketing and Corporate Relations for Northstar EAP, Kaylie Snow and Marquette County Ambassador Dave Puskala. 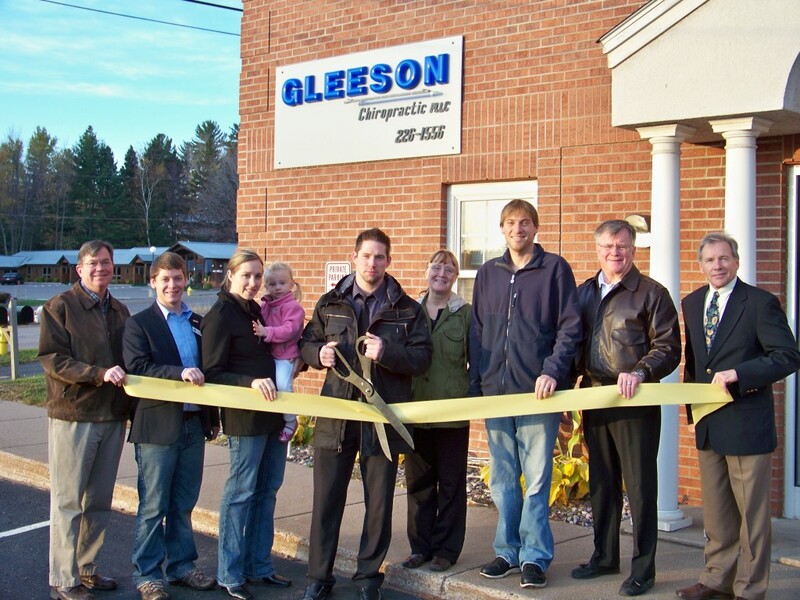 The Lake Superior Community Partnership recently held a ribbon cutting in Marquette Township to commemorate the opening of Gleeson Chiropractic. Owner and chiropractor Aaron Gleeson is dedicated to providing high quality care at competitive rates. Gleeson Chiropractic is located next to Buffalo Wild Wings and is currently welcoming new clients. Attending the celebration were Marquette County Ambassador Dennis West, Lake Superior Community Partnership economic development liaison Derek Bush, Jennifer Gleeson (sister-in-law), Audrina Gleeson (niece), owner/chiropractor Aaron T. Gleeson, Susan Anderson (mother), Rich Gleeson (brother), Marquette County Ambassador Sam Elder and Marquette Township manager Randy Girard. 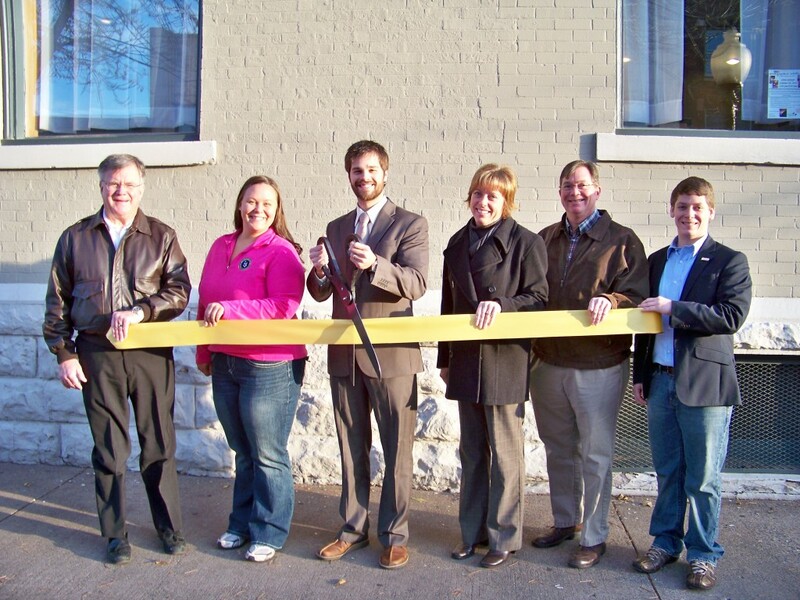 Integrated Wellness Chiropractic held a ribbon cutting ceremony with the Lake Superior Community Partnership to celebrate the opening of their practice in Downtown Marquette. President Dr. Brandon Turino is the son of long time chiropractor Bruce Turino, and is dedicated to helping patients achieve their health and wellness goals. Attending the ribbon cutting were Marquette County Ambassador Sam Elder, Lake Superior Community Partnership director of marketing and public relations Lindsay Hemmila, Integrated Wellness president Dr. Brandon Turino, chiropractic assistant Tonya Darner, Marquette County Ambassador Dennis West and Lake Superior Community Partnership economic development liaison Derek Bush. The Lake Superior Community Partnership held a ribbon-cutting with St. Vincent de Paul to celebrate moving their office and food pantry to a new location inside the Negaunee Center at 205 Iron Street in Downtown Negaunee. St. Vincent’s is always in need of food donations of all types such as soups, pasta, rice, packaged dinners, flour, salt, vegetables, as well as laundry detergent, toothpaste, bath soap, cleaning essentials, basically anything that we would use for our own families. Attending the ribbon cutting was Marquette County Ambassador Jesse Bell, Lake Superior Community Partnership director of marketing and public relations Lindsay Hemmila, Kathy Thurner, Steve Perucco, Kathy Bleau and Tom Bleau all St. Vincent volunteers and Marquette County Ambassador Tom Edmark. Northern Michigan University and the Lake Superior Community Partnership held a ribbon-cutting to celebrate the Grand Opening of Northern Michigan University’s Temaki & Tea and Smoothie King, which now share the former Hardee’s facility on Presque Isle Avenue in Marquette. Temaki & Tea, a Japanese-style cuisine restaurant, was formerly located in NMU’s C.B. Hedgcock Building. 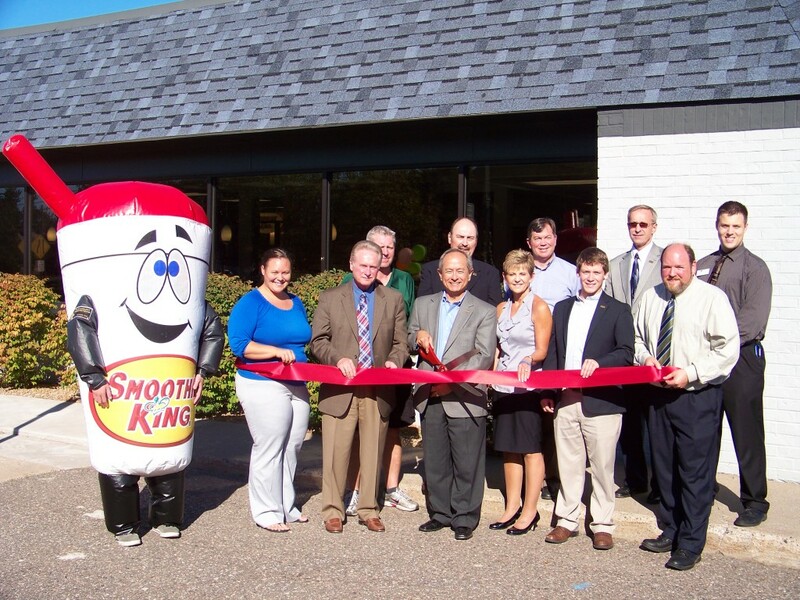 Smoothie King, which offers natural fruit smoothies, is a new addition to Northern’s dining facility options. Attending the ceremony was (right to left) Lake Superior Community Partnership director of marketing and public relations Lindsay Hemmila, Northern Michigan University interim provost Paul Lang, Marquette City mayor John Kivela, NMU president Dr. Les Wong, NMU Board of Trustee Jack LaSalle, Marquette County Ambassador Chris VanAble, Marquette County Ambassador Dennis West, Lake Superior Community Partnership economic development liaison Derek Bush, NMU associate vice president – business operations Art Gischia, NMU director of NMU Dining Services Greg Minner and Temaki & Tea/Smoothie King manager Paul Schoonveld. 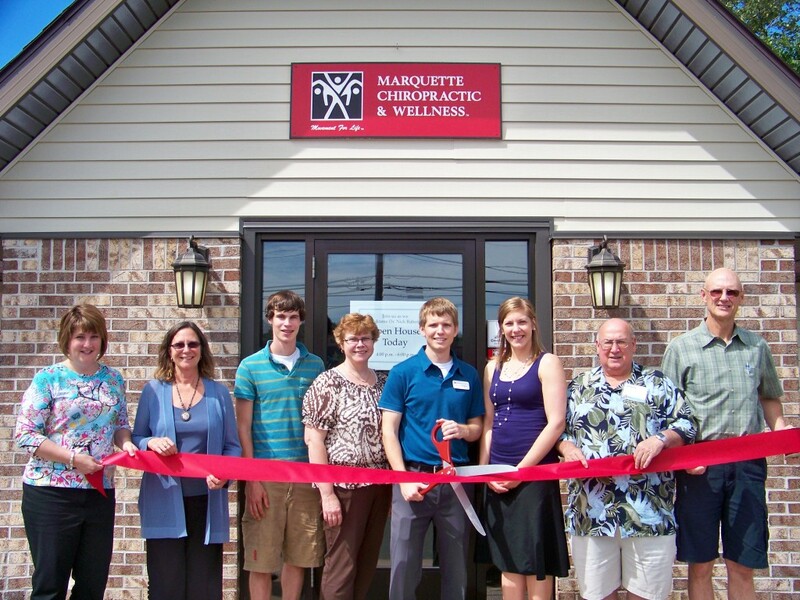 Marquette Chiropractic and Wellness held an open house and ribbon cutting to welcome Dr. Nick Raboin, D.C. to their team. “The UP is such an amazing place with great people. I want to be able to give back to this community and leave it with healthier, happier people” commented Dr. Raboin. Attending the ribbon cutting was Lake Superior Community Partnership chief executive officer Amy Clickner, Marquette County Ambassador Christine Pesola, Nathan Raboin (brother), Norma Raboin (mother), Dr. Nick Raboin and wife Stephanie Raboin, Marquette City Mayor Pro-Tem John DePetro and Marquette County Ambassador Tom Tourville. Dr. Raboin is currently accepting new patients. For more information or to set up an appointment, please call 906.225.0660, email marquettedc@gmail.com or visit them on the Web at www.marquettedc.com. Veridea Group members broke ground on their West Towne Center, a development that’ll bring twelve new storefronts to a highly commercialized area of Marquette Township. The two acre property sits on Wright Street near Super One Foods and Range Bank. The two million dollar project will include a much anticipated Arby’s branch that’s set to open by the end of the year. Wild Birds Unlimited is also moving in from its Jilbert Center location. In attendance for the Ground Breaking were George Meister (TriMedia), Bromley Hall (Hall Contracting), Mike Berger (WildBirds Unlimited), Robert Mahaney (Veridea Group), Boris Martysz (Mbank), Chris and Isaac Cooper (Arby’s), Bethany Cody (Veridea Group), Jason McCarthy (Marquette Twp), Randy Girard (Marquette Twp), Michelle Sellers (River Valley Bank), Lindsey Hemmila (Lake Superior Community Partnership), Nicole Grim (Veridea Group). SIR Federal Credit Union in Negaunee commemorated their name change and new look with a ribbon cutting with the Lake Superior Community Partnership. 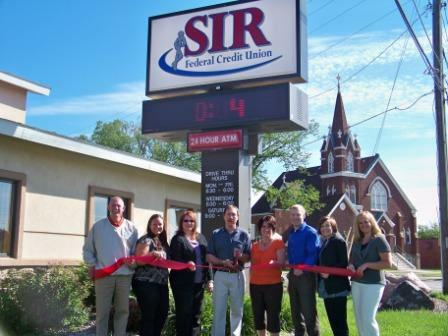 SIR, most recently known as Superior Iron Range Community Federal Credit Union, has been an enduring member of the community for many years. 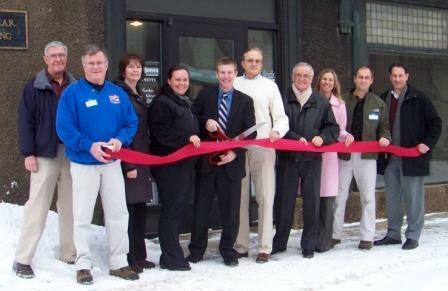 Financial cooperatives such as the Negaunee Community Federal Credit Union, the Government & Railroad Employees Federal Credit Union, the Marquette Municipal Federal Credit Union, and the Soo Line Credit Union have combined over the years to become the institution they are today. Attending the ceremony was Marquette County Ambassador and Lake Superior Community Partnership chairman Tom Edmark, Lake Superior Community Partnership director of membership and marketing Lindsay Hemmila, SIR Federal Credit Union human resources manager Heidi Yakovich Davidson, chief executive officer Ronald Lauren, branch administrator Marie Molise, chief financial officer Josh Vissering, Hanna Johnson of the Lake Superior Community Partnership and Greater Ishpeming-Negaunee Area Chamber of Commerce executive director Elizabeth Peterson. Curran & Company held a ground breaking ceremony with the Lake Superior Community Partnership to celebrate the start of construction on the new Hillside Townhomes. The new townhomes will be one and two bedroom units located next to Curran & Company’s Cedarville Townhomes at 1520 Commerce Drive in Marquette Township. Attending the ceremony was Curran & Company lead maintenance Jack Wirth, Lake Superior Community Partnership director of marketing and membership Lindsay Hemmila, Marquette Township Treasurer Ernie Johnson, Curran & Company rental manager Nicki Brozek, Menards sales manager Scott Lotterman, Curran & Company co-owner Melissa Curran, Marquette County Ambassador Michele Butler, Curran & Company co-owner Mark Curran, Marquette County Ambassador Dave Puskala, Curran & Company customer service representative Dawn Johnson, Marquette County Ambassador Jim Grundstrom, Curran & Company maintenance Rob Heikes, Frei Chevrolet sales team leader Andy Grundstrom and Marquette Township Manager Randy Girard. 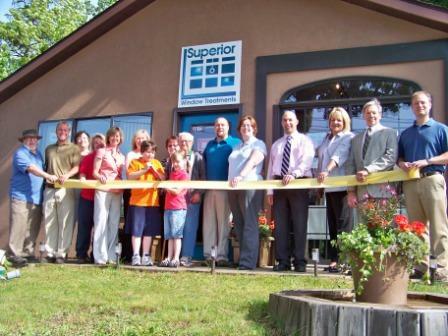 Superior Window Treatments kicked of their open house at 2612 U.S. Hwy 41 in Marquette, across from Frei Cheverolet, with a ribbon cutting with Lake Superior Community Partnership. Superior Window Treatments is the Marquette’s only authorized Hunter Douglas dealer with a brand new showroom entirely dedicated to window blinds. In attendance at the celebration was Paul Anderson, owner’s dad, Matt Miley of the Lake Superior Community Partnership, Pam Holbert, owner’s mother-in-law, Laura Sikkema, accountant, Kathy Leone and Lisa Nyquist of Northern Initiatives, Ethan Anderson, owners’ son, Margarette Anderson, owner’s mother, Haley Anderson, owner’s daughter, Roswell Anderson, owner’s grandfather, Superior Windows Treatments owners John and Brooke Anderson, Chris Gobert of Range Bank, Hunter Douglas Sales Representative Dana Spremo, Marquette Township manager Randy Girard and Lake Superior Community Partnership communications specialist Tony Stagliano. Holiday Travel has been in business and locally owned and operated for 55 years, and has moved to a new location in Marquette. To celebrate, they marked the occasion with a ribbon cutting ceremony with the Lake Superior Community Partnership at their new location behind Shopko at 1440 West Ridge Street in Marquette. Holiday Travel was started in 1956 by Don Pearce and Homer Hilton and was the first travel agency in the Upper Peninsula. The original office was located in the Harlow block but quickly moved to the Northland hotel. Anita Johns became partners with Pearce in 1978, and in 1990 Johns and Jan LaValley purchased the business. Holiday Travel was purchased by Laura Nelson in April of 2010. Attending the ribbon cutting was Marquette County Ambassador Jim Grundstrom, Lake Superior Community Partnership marketing and membership director Lindsay Hemmila, travel agent Lynn Dalton, Holiday Travel owner Laura Nelson, travel agents Jan LaValley and Anita Johns and Marquette County Ambassador Steve Balbierz. 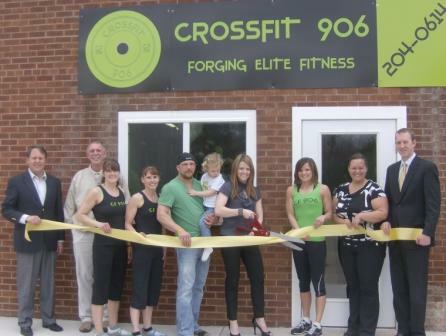 A ribbon cutting was held for CrossFit 906 to celebrate their growth into a new larger facility on 144 Greenwood Street in Downtown Ishpeming. Owners Jill and Shay Korpi, a CrossFit affiliate since November 2010 have moved their fitness center from a 500 square foot facility to a 2,500 square foot building and added five more trainers for a total of seven. The new building features access to the Iron Ore Heritage Trail directly across the street for workouts, and a kid’s corner for children to play while their parents workout. Members can workout on their own our in Group classes. Classes are offered weekdays and weekends for Group training lead by certified CrossFit trainer. One-on-one sessions are available by appointment. Members have access to the facility 24/7. Find and “like” them on Facebook, or for an online consultation visit www.crossfit906.com. Attending the ribbon cutting were Marquette County Ambassadors Keith Moyle and Tom Edmark, CrossFit trainers Shannon Terres and Nichole Asgaard, Owners Shay and Jill Korpi with their daughter Laynie, Crossfit trainer Tina Mattson, Lake Superior Community Partnership membership and marketing director Lindsay Hemmila and Marquette County Ambassador Jesse Bell. 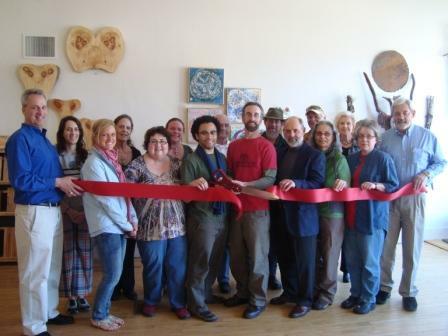 Zero Degrees Artist Gallery celebrated their expansion at 525 N. Third Street in Marquette with a ribbon cutting with the Lake Superior Community Partnership. Zero Degrees Artist Cooperative doubled their gallery space with many new works of art being presented. The gallery is open daily from 11am to 5pm, and open until 8pm on Fridays. To learn more, visit them on Facebook or learn more information on all of the artists at www.zerodegreesgallery.com. Attending the ribbon cutting were Marquette County Ambassador Pat Bray, Zero Degrees Artist Lanni Lantto, Lake Superior Community Partnership community development coordinator Kahlea Berry, Zero Degrees co-owner Linda Maxson, artist Maggi Haupt, co-founder Carrie Irish, artists Dominic M. Davis, Bud Williams, Justin Savu, Scotter Schieler, Earl Senchuk, Ron Morgan, Judy Sarosik, Karen Jilbert, Lee Penberthy and Marquette County Ambassador John Marshall. 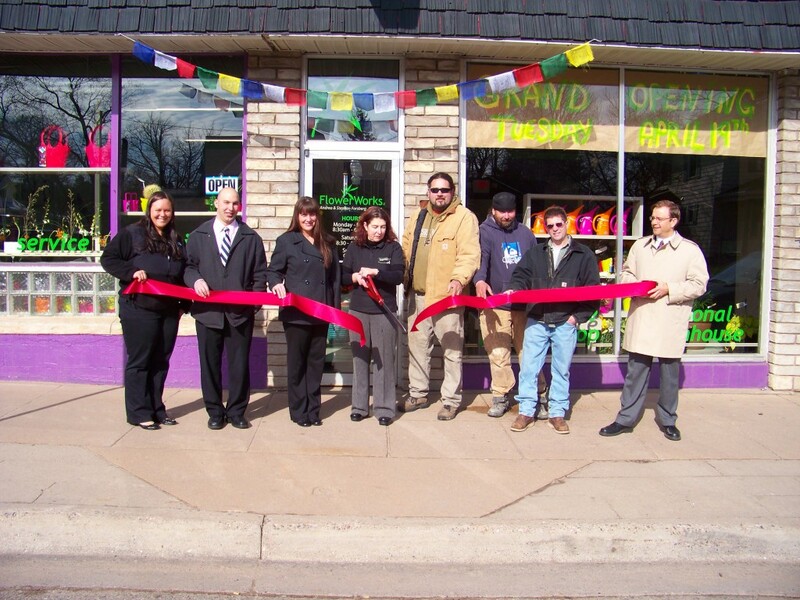 The Grand Opening of Flower Works was celebrated with a ribbon cutting ceremony with the Lake Superior Community Partnership. Former part owner of Forsberg Flower Inc., Stephen Forsberg and his wife Andrea have opened their new full-service flower shop with a seasonal greenhouse at 1007 N. Third Street in Marquette. Attending the ribbon cutting for Flower Works was Lake Superior Community Partnership director of marketing and membership Lindsay Hemmila, Chris Gobert of Range Bank, Kristie Patron of the Village Business Association, Flower Works owner Andrea Forsberg, Timber Ridge Construction foreman Michael Patron, Timber Ridge Construction owner Tim Prisk, United Contractors Inc. owner Tim Soucy, and Marquette County Ambassador Steve Balbierz. 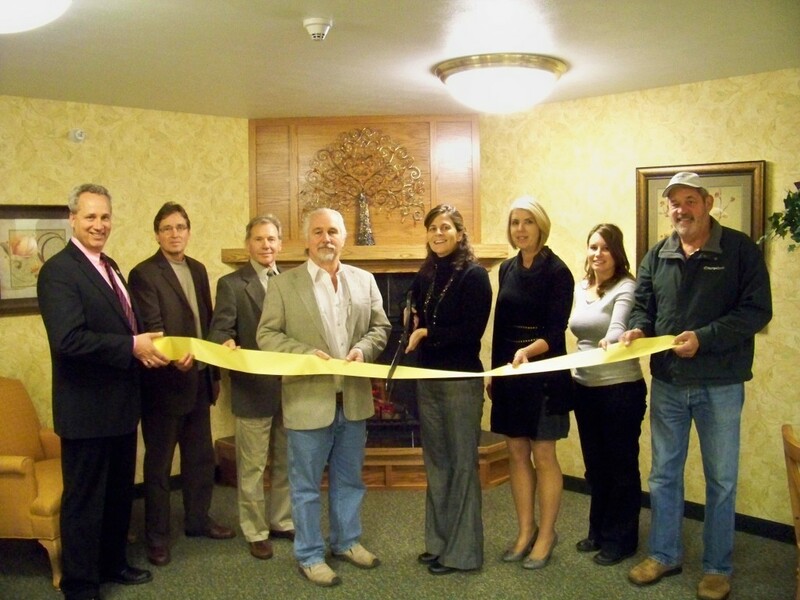 Warner Creek Residential Care Facility in Palmer held a ribbon cutting with the Lake Superior Community Partnership to commemorate their fifth year of business, and five employees who have been with the facility for five years. Holding the ribbon for the honorable occasion was Marquette County Ambassador Jesse Bell, Warner Creek employees Glory Laituri, Karen Manninen, owner Sara Miller, employees David Swanson, Janet Ely, Sharon Brownell, Bonnie Powrozek, Mary Larson, Shana Epps, and Marquette County Ambassador Dale Hemmila. Miller purchased and refurbished the facility in 2005, and opened Warner Creek as a licensed home for the aged, providing a home for 30 residents aged 60 and older. For more information on Warner Creek Residential Care Facility, contact them at 475-4640. 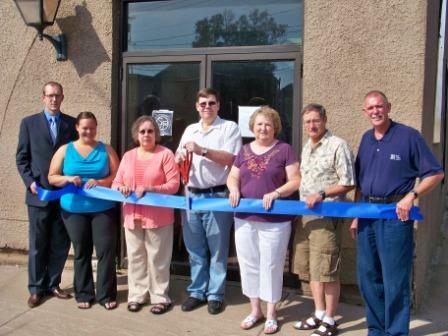 Upper Peninsula Family Solutions celebrated its one year anniversary with a ribbon-cutting ceremony at its new location at 307 South Front Street, Marquette with the Lake Superior Community Partnership. Attending the ceremony were Lake Superior Community Partnership director of marketing and membership Lindsay Hemmila, Kelli Harvala, Val Poutanen, Amanda Merek, Brian Miller, Liz Smith, Upper Peninsula Family Solutions executive director Rick Sanville, Del Compton, Tracey Compton, City of Marquette mayor pro-tem Johnny Depetro, Lake Superior Community Partnership assistant to economic development and operations Jen Tucker, Lake Superior Community Partnership business development specialist Caralee Swanberg. 3rd Street Day Spa & Salon celebrated their Grand Opening with a ribbon cutting ceremony with the Lake Superior Community Partnership. Picture in the front row is Marquette County Ambassador Dan Landers, Lake Superior Community Partnership director of marketing and membership Lindsay Hemmila, 3rd Street Day Spa & Salon owner Carol Rector, Marquette County Ambassador Sam Elder. Back row is Lake Superior Community Partnership community development coordinator Kahlea Berry, City of Marquette mayor John Kivela, 3rd Street Village member Luanne Forsberg, and Marquette County Ambassador Steve Peffers. 3rd Street Day Spa & Salon offers hair car, skin care, massage and a variety of stress relieving spa treatments. To learn more visit www.3rdstreetspalon.com, call 225-5001 or visit them at 816 North Third Street in Marquette. 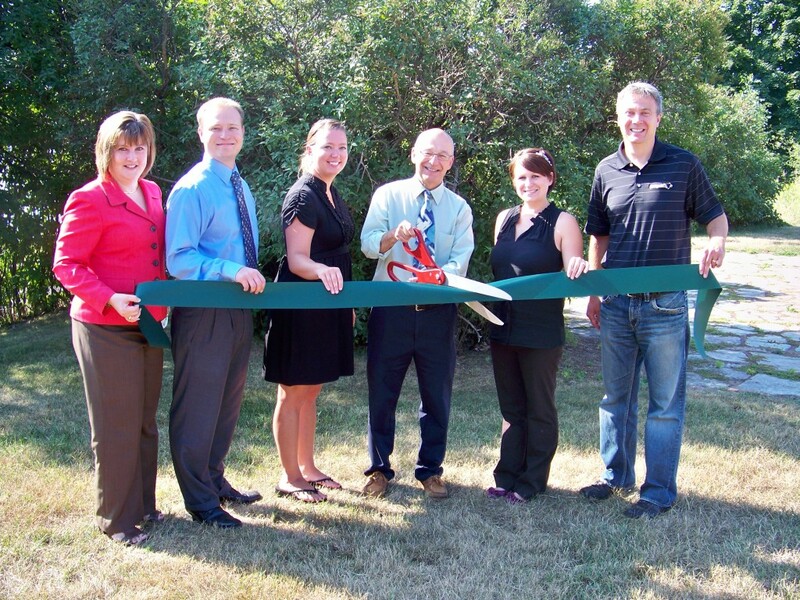 The Lake Superior Community Partnership held a ribbon cutting to celebrate Dr. Christa (Goodman) Hubbard D.C. opening her own chiropractic clinic, Horizon HealthWorks PC, at 2822 Venture Drive in Marquette. Joining the celebration was Marquette County Ambassador Dan Landers, Dr. Heidi Johnson, Superior Eye Health; Greg Goodman (Christa’s Brother), Tessa Jo Hubbard (Christa and Ryan’s Daughter), Jason Hubbard (Christa’s brother-in-law), Cheryl Hubbard (Christa’s sister-in-law), Jeff Hubbard (Christa’s father-in-law), Ryan Hubbard (Christa’s Husband), Christa Hubbard (owner Horizon HealthWorks P.C. ), Linda Goodman (Christa’s mother), Julie Liberty (Family friend), Gary Goodman (Christa’s father), and Marquette County Ambassador Steve Peffers. Horizon HealthWorks offers innovative services in the field of Functional Neurology, a specialized healthcare field which uses various non-drug, non-surgical approaches to elicit improved function of the brain and neuromuscular skeletal system. Christa takes much pride in her work and would be honored to help those who have health concerns. She encourages those who have questions about the services provided to contact the office and schedule a consultation. She looks forward to giving back to her beloved hometown and surrounding areas. 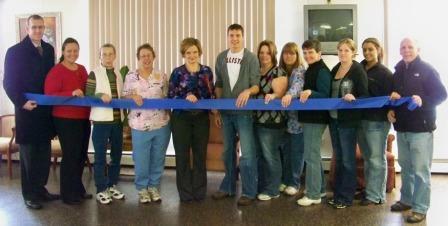 For more information, visit www.horizonhealthworks.com or call 906-225-8011. A ribbon cutting was held for Doug Gordon of Edward Jones in Marquette, commemorating the move to a brand new location in the Longyear building at 200 N. Front Street. Attending the ribbon cutting was Bob John, Marquette County Ambassador Sam Elder, Lake Superior Community Partnership vice president of economic development Lois Ellis, Lake Superior Community Partnership director of marketing and membership Lindsay Hemmila, Edward Jones Financial Advisor Doug Gordon, Marquette City commissioner Fred Stonehouse, Lake Superior Community Partnership board member Tom Baldini, Edward Jones office Administrator Amanda Caroen, Marquette County Ambassador Dan Landers, and Lake Superior Community Partnership board member Tom Mogush. For more information contact Doug Gordon by calling 226-2852 or by email at douglas.gordon@edwardjones.com. 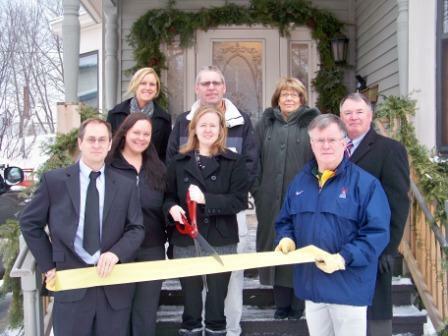 A ribbon cutting ceremony was held on Wednesday, January 12, 2011 for the Catholic Diocese of Marquette in honor of their new home at 1004 Harbor Hills Drive in Marquette. Those attending the ceremony were Lake Superior Community Partnership membership & marketing director Lindsay Hemmila, Marquette County Ambassador Lisa Coombs-Gerou, Lake Superior Community Partnership community development coordinator Kahlea Berry, Marquette County Ambassador Christine Pesola, From the Diocese of Marquette Tim Thomas, Loreene Zeno Koskey, Terri Gadzinski, Sheila Wickenheiser, John Dehlin, Bishop Alexander Sample, Deacon Scott Jamieson, Denise Foye, Pam Erickson, Judy Jason, Greg Gostomski, Colin Jenkins, and Marquette Ambassador Sam Elder. For more information on the The Diocese of Marquette call (906) 225-1141 or visit www.dioceseofmarquette.org. 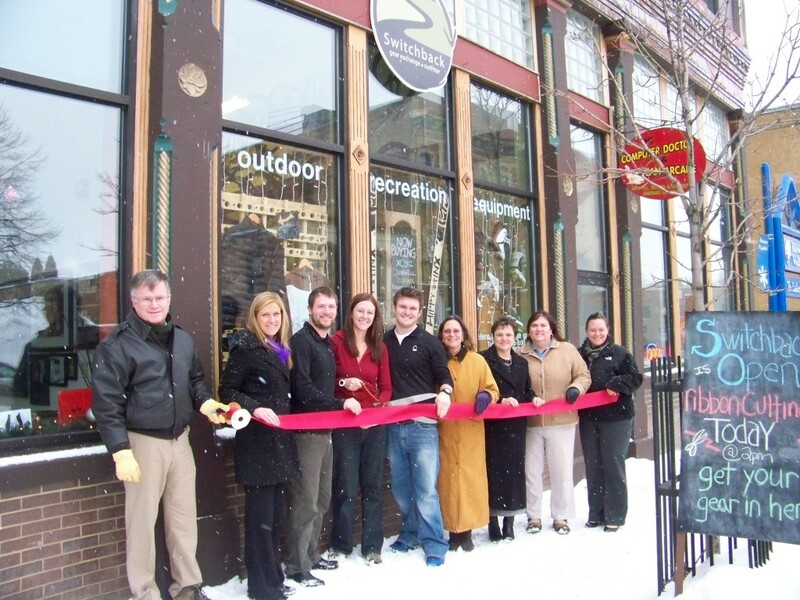 Switchback Gear Exchange celebrated their Grand Opening at 209 South Front Street, Marquette with a ribbon cutting ceremony with the Lake Superior Community Partnership on Wednesday, January 12, 2011. Attending the ceremony were Marquette County Ambassador Sam Elder, Lake Superior Community Partnership community development coordinator Kahlea Berry, Switchback Gear Exchange Owners Mike and Rachel Posthumus, Switchback Manager Adam Constance, Marquette County Ambassadors Christine Pesola, Mona Lang, Lisa Coombs-Gerou and Lake Superior Community Partnership director of marketing and membership Lindsay Hemmila. Open six days per week, Switchback Gear Exchange buys and sells used outdoor recreation equipment. They also sell equipment on consignment, where sellers earn 60%, 70%, or 80% of the sale depending on the item. To learn more about Switchback Gear Exchange, go to www.goswitchback.com on the web, or visit their store on South Front Street across from Getz’s. Thomson & Paquette, P.C. 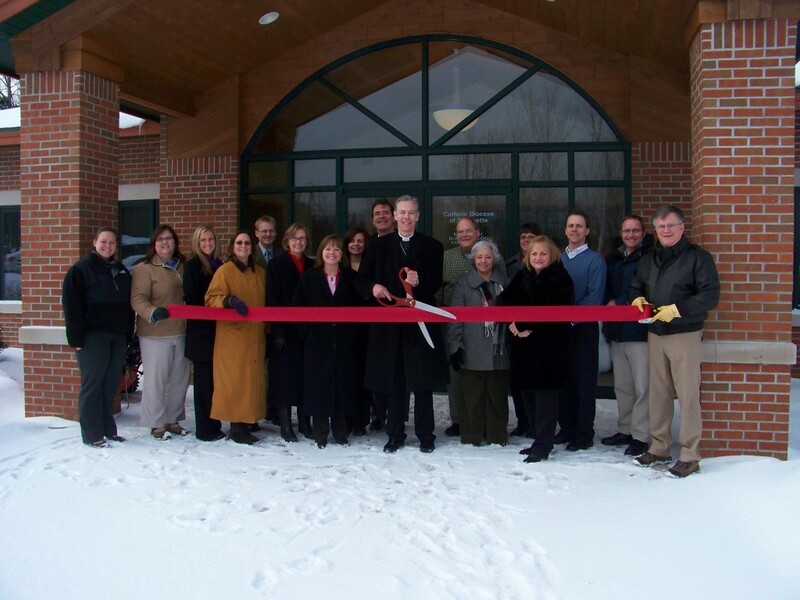 recently celebrated its firm’s growth with a ribbon cutting ceremony on Wednesday, January 5, 2011 in conjunction with the Lake Superior Community Partnership. Attending were Marquette County Ambassador Dan Landers; Lake Superior Community Partnership business development specialist Caralee Swanberg; accounting intern Michael Turton; firm partners Patrick Thomson, CPA and Jill Paquette, CPA; Rebecca Schneiderhan, C.P.A; Lake Superior Community Partnership membership and marketing director Lindsay Hemmila and Marquette County Ambassador Steve Peffers. Thomson & Paquette, P.C., a certified public accounting firm formerly Thomson & Thomson, P.C., is pleased to announce the addition of Rebecca Schneiderhan, CPA to their staff. Patrick Thomson, Jill Paquette, or Rebecca Schneiderhan can be reached at 906-226-1979. 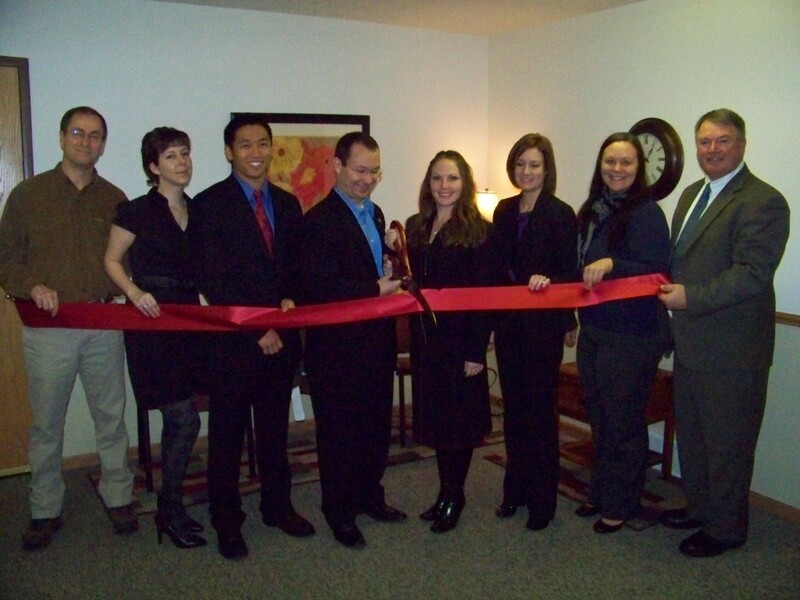 Their office is located at 1901 W. Ridge St. Suite 3 in Marquette.